The first time I heard about the importance of having really good works of art displayed in hospitals, I thought to myself, what a strange idea. With all the drama taking place there, who is going to pay attention to the art on the walls? But then, years later, watching my parents fight their last battles in the Cedars-Sinai Medical Center I became fully appreciative of the emotional support I received there from all the artworks hanging throughout the miles of its corridors and waiting areas. It was not only a welcome distraction, but much needed medicine: medicine for my eyes and medicine for my soul. I was thrilled when I was asked to join Cedars-Sinai's Art Council, which is responsible for the hospital's vast art collection. 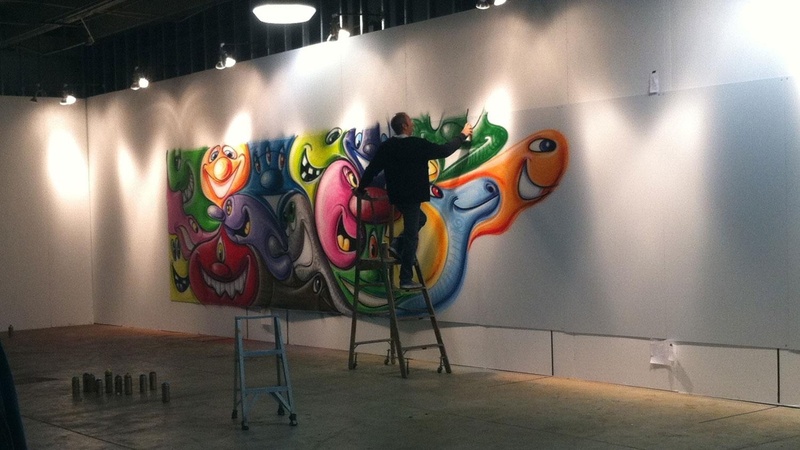 At our last meeting we went to watch the well-known American artist Kenny Scharf in the midst of spray-painting one of his trademark wall murals. If you look at my photos on the website, you will see the tiny figure of the artist against a long and narrow stretch of this painting in progress. Painted on aluminum panels, the mural will be installed at the new Pediatric Center where his joyful, cartoon-like characters will be a welcome presence for kids and their parents. Only a few months ago another impressive mural by Kenny Scharf was unveiled at the new and ambitious West Hollywood Library, on the wall of its parking garage. In addition to that, murals by two other well-known street artists, Shepard Fairey and RETNA, can be seen as you pass the Library at the intersection of Melrose Ave and San Vicente Blvd. As far as I'm aware Cy Twombly never painted outdoor murals, but seeing the exhibition of his last paintings that just opened at the Gagosian Gallery in Beverly Hills, I thought about bursts of unyielding energy, so characteristic of this octogenarian artist in the last years of his life. Each of his monumental paintings, with their spiraling movement of a gigantic brush, looks like it was executed with the help of happy angels who had consumed more than a bottle or two of good Chianti. I have to admit that I don't know too much about the personality of Alexander Calder but being an admirer of his unfailingly dynamic and upbeat art, I imagine him to be a man of genius with a childlike sense of wonder. His sculptures, especially his famous mobiles, always make me smile, returning me momentarily to the playgrounds of childhood, where anything was possible. I urge you not to miss the pleasure of seeing several dozen of Calder's sculptures and paintings in the exhibition that just opened at L&M Gallery in Venice. I want to finish today's Art Talk with an apology to those of you who somehow, thanks to the mystery of technology, stopped receiving my weekly newsletter. Please send me a note and I will be happy to put you back on the list where you belong.